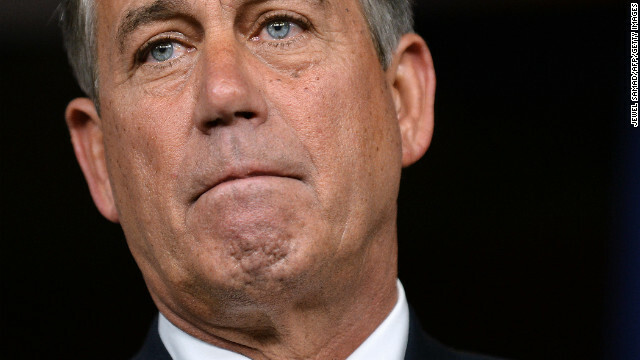 Washington (CNN) – House Speaker John Boehner threw in the towel on Tuesday. After multiple attempts to lead his members to force some sort of concession in return for raising the nation’s debt limit, Boehner allowed a vote on a so-called “clean” debt limit increase that passed by a 221-201 margin before the House left town until the end of the month. The Speaker and just 27 other House Republicans joined 193 House Democrats to pass the bill. One hundred and ninety nine House GOP members opposed the measure, including some members of the Speaker’s own leadership team and House Budget Chairman Paul Ryan. It was the latest in long series of Boehner being stymied by House conservatives, but this time there was a significant difference - there was little political brinksmanship. After last fall's government shutdown that caused Republican poll numbers to plummet, Boehner and most House GOP members agreed they didn't want to set up a major confrontation on the debt bill. Instead, they decided to push for some modest concessions. But many conservatives resisted even that limited strategy, arguing they didn’t want to fight for a plan that would eventually be rejected by Senate Democrats. Others felt the House GOP should attach at least one condition to the bill. So Boehner and other House Republicans spent the last couple of weeks floating a series of targeted proposals they hoped could get enough support to pass. But roughly 16 hours after presenting his last effort – a bill that tied the debt limit increase to a provision reversing cuts in military pensions – it was clear Boehner and other top GOP leaders didn’t have the votes so they abandoned that proposal. Boehner told reporters early Tuesday that his narrowly crafted proposal wouldn’t get 218 votes - enough Republicans to pass without Democratic votes – and said flatly, "When you don't have 218 votes, you have nothing." Referencing previous times when his own members prevented him from moving legislation, Boehner added, "We've seen that before, we see it again." The Speaker made it clear publicly and privately in the last couple of months that he wasn’t going to allow a default, but he also told his members if they wanted to demand any condition for raising the debt ceiling they needed to unite behind it. But as has been the case on issue after issue, he couldn’t get his members on the same page on a strategy. Even though Boehner didn’t get support from the vast majority of House conservatives he did manage to demonstrate to some of his members that the debt ceiling isn’t an issue the party should turn into a major war right before the deadline. Many conservatives, who just a couple of years ago publicly questioned whether it was even necessary to raise the debt ceiling, now acknowledge Congress did need to grant Treasury the borrowing authority and move on to debate other issues. Louisiana Republican Rep. John Fleming told CNN that Boehner and other leaders were "not even close" to getting sufficient support to move forward with their plan on Tuesday morning. But he said the decision to press the Democrats to pass the bill allows his party to "move on" and return to their focus on Obamacare. Boehner argued "it’s the President's debt" and tried to place the burden on House Democrats to avoid a default. "He's the one driving up the debt and the question they're [House Republicans] asking is why should I deal with his debt limit? And so the fact is we'll let the Democrats put the votes up. We'll put a minimum number of votes up to get it passed," Boehner told reporters after a closed door meeting with House Republicans. Hours before the vote House Democratic Whip Steny Hoyer told reporters Tuesday it was "pathetic" that the Speaker was only committing to getting the low number of GOP votes to pass the measure. Until recent years, votes to raise the nation's borrowing authority - which covers the debt accumulated by previous congressional spending measures - did not come this close to the deadline or involve heavy lifting. But since President Barack Obama was elected and Republicans took control of the House in 2010, a solid block of conservatives has vowed to oppose any measure to raise the debt ceiling unless it also cuts spending. The Speaker instituted "the Boehner Rule" that stated any bill to raise the debt limit had to be linked to package of cuts and reforms greater than the increase. While Boehner attempted to place the responsibility for raising the debt limit on the President, the reality is that pushback from many House conservatives - which has regularly been an issue for Boehner – again hampered his efforts. Despite the embarrassing setback of having yet another proposal of his pulled at the last minute, Boehner didn't seem fazed by the development. He walked out of the House GOP leadership's press conference Tuesday morning singing an upbeat verse from the song "Zippidity Do Da." CNN’s Paul Courson contributed to this report. The whole thing is a joke and there never will be a solution, so just keep printing money that I may eat my lobster and go on vacation. I think it now fair to be more specific with blames..Lets not blame congress but blame their leaders. If Boehner deciedes do not put bills up for vote then it gets stalled.. So we can comfortably say Boehner is to be blamed for slow progress in the house for refusing to put up bills for a vote..
Come on people! This was so predictable. It's an election year. Why would congress "stoke the fire" now at this time? Are we the people so predictable by congress that we would except this little olive branch as a way to say that "they finally got it?" Are government seems no longer about "....for the people, buy the people". Its all about meisum, whats in it for them........its about being Re-elected! Maybe we should ask our local reps to pass a law for indivdual bail-outs? Defeating this presidents policies is an admirable agenda. Destruction of the middle class is well underway and probably would be, regardless of which of the 2 existing parties are in power. Since that appears to be the goal, I would rather get there a lot slower than the full throttle Obama prefers. Boo to the Republicans for letting the Democrats continue their spending spree. Enough money to spend on votes...if the nation is in debt, who cares...we need votes and power. It is obvious this is a dumbocrat page with bumbos that can't think for themselves contributing for the most part. If you think the dems should get your vote in every race, I'll be back in 2016 to see how you like your new dictatorship called King Obama. I have been around a long time and all these immigrants aren't here because the living conditions were so great where they came from, but rather because for the most part of the way of gov. mostly dictators with citizens fearing to speak their mind. But then the demosocialists can't see that because they have never had to experience it. This country's day are numbered. Trillions upon trillions of debt, it is only a matter of time. Maybe because they realized that routine things like passing a budget or raising the debt ceiling is not the time or place for ideological showdowns. I welcome debate on Obamacare to hopefully mitigate its negative effects, but the republican party has taken a beaten. Fiscal 2012/2013 deficit was 642 billion down down 71% from 2011/2012 deficit of 1.1 trillion..........people who are always looking for a good or bad excuse to point fingers should give some kudo's to both congress and the president for addressing the need of moving towards a balanced budget, even if it takes a while.......is everyone partisan? Can anyone out there actually judge things on merit rather than 100% partisanship? Finally the GOP gets it. When Dems are in power, step aside and let them shoot themselves in the foot. Republicans hurt both themselves and the country during their last government shutdown and default fiasco. The GOP's little stunt cost the economy 24 Billion dollars and hundreds of thousands of private sector jobs. I hope that this means that they will stop acting like children going forward. Check out the origins of the song that Boehner sung.... Whose shoulder is the 'Bluebird sitting one." Politicians should no better. Obama is not the anti-Christ … but he is here to usher her in.